Fire must have been a bright point of discovery for early man. From cooking and providing warmth, to glowing light and powerful combustion, the uses for fire are too long to list. For survival purposes, fire is needed for warmth, staying dry, purifying water, and cooking. To start a fire, you need oxygen, fuel, and heat- even if you are starting a fire without matches. 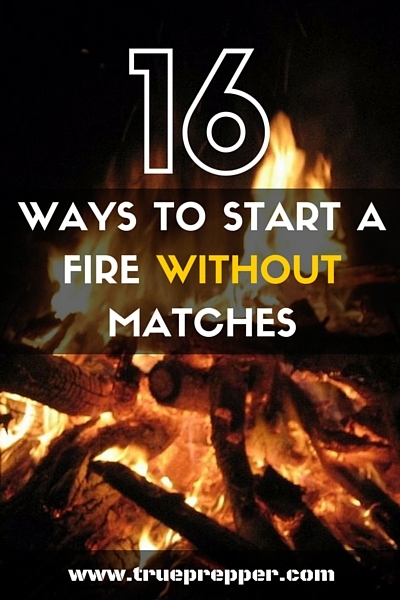 Below are sixteen different methods to provide that heat to an ignition point. As always, be safe if you try any of these methods and have a way to extinguish the fire readily available. Striking the flint against the steel creates sparks that can be used to ignite the fuel source. 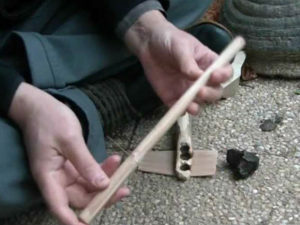 Basic lighters use flint and steel to create a spark, so this method of fire starting is very common. The sparks are lower temperature than those from a ferro rod. A ferrocerium rod is a man-made material that sheds sparks when scraped with a rough surface like ridged steel. The sparks are very hot, and are great for igniting tinder quickly. A hand drill is a hand held spindle and baseboard, usually made up of softer wood. The wood choice is important, green wood does not perform well even if it is soft, and picking a wood that is too soft could make the spindle crumble under pressure. Spinning the spindle rapidly on the baseboard creates an ember that can be transferred to tinder to create a fire. 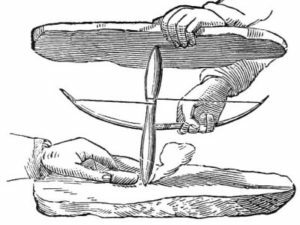 A bow drill is similar to a hand drill, but you add a handhold, bow, and string. The handhold can be a concave rock or carved wood to put pressure down on the spindle. 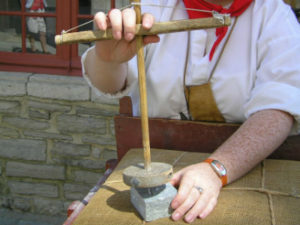 The string is drawn on the bow after wrapping it around the spindle. When you push and pull the bow, the string causes the spindle to turn quickly. A pump drill is similar to a hand drill as well, but a flywheel and crossbar is added. The crossbar has the spindle placed through it and then has the string tied to it and routed above the end of the spindle. This is one of the hardest primitive drills to create, but the easiest to operate since the flywheel gets the spindle going fast using its momentum. To make a fire plough, you need a hard stick and a soft plank. Push the stick down the plank in a line repetitively, pushing the shavings off of the end onto tinder. Stamina and endurance is key here, just as it is with the drills above. Once enough hot shavings are pushed off the end, a fire should ignite in the tinder. 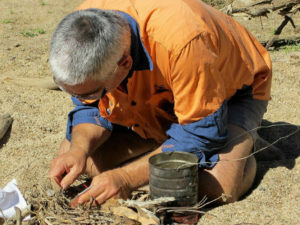 This is one of the earliest and simpler methods of creating fire, and is where the saying “rubbing two sticks together to make a fire” comes from. A quick physics lesson reminds us that pressure and heat are directly related. Compressed air can become very hot very quick, especially if the compression is repeated. A fire piston is a piston you manually pump to bring the sealed air to a very high temperature, which then lights the tinder placed inside. Make a small pile of powdered chlorine and carefully pour a small amount of brake fluid on it. The mixture should heat up rapidly and start a small fire. Be aware that it does have explosive potential and may react with other surfaces nearby. A magnifying glass of any type can start a fire with permitting weather conditions. 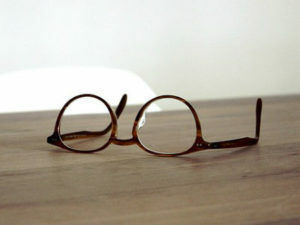 Eyeglasses, old TV screens, and glass can all be used to focus sunlight into a small point to ignite tinder. Put some water into a ziplock bag, a balloon, saran wrap, or even a condom and then shape the container into a sphere. The water in the clear container acts as a lens and has a very short focal length of 1-2 inches. You will need to hold the container close to the tinder for the focal point to be close enough. Shave the ice into the shape of a lens. Once you have a basic shape, it will need to be polished and then find the focal length. Focus the sun through the ice lens to heat up some tinder and start a fire. Out of all of the options on this list, this one is likely the hardest to accomplish. Rubbing a chocolate bar or toothpaste on the bottom of a soda or beer can can polish it so it is a concave reflective surface. It is so reflective that you can use it to reflect the sun in a focal point on some tinder to get a fire started. 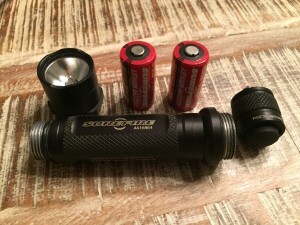 Removing the reflective cone of your flashlight and using it as a parabolic firestarter is one of the toughest options to use to start a fire, but it is possible if the sun is out. Using one of the batteries may be a better option, which is covered next. Nine volt batteries are fairly common, and one place to easily find one is in a smoke detector. Steel wool is a staple in most workshops and garages. Combine the two, like shown in the video below for a portable electrical firestarter. Use a foil gum wrapper to span from the positive terminal on a AA battery to the negative terminal. Hold the wrapper in place on the ends and the wrapper will heat up and ignite and burn quickly from the middle of the gum wrapper. A car, even without gas, has many tools in it that can start a fire. One of the easiest is crossing the terminals on the battery using jumper cables to create a spark. If you don’t have a pair of jumper cables in your car, you should consider getting a set for practical emergencies as well as for their survival benefits. 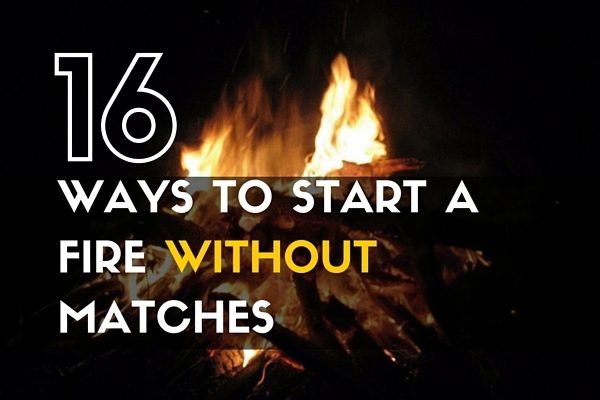 If you know of any other clever methods for starting a fire without using matches, feel free to comment below to share your ideas. Keep learning and stay safe. Try a welding flint striker. Looks like a giant safety pin. Squeeze and sparks fly. Easy peasy. Bonus they are easy to carry or attach to your pack.